‘Law and the Idea of Liberty in Ireland: From Magna Carta to the Present’. 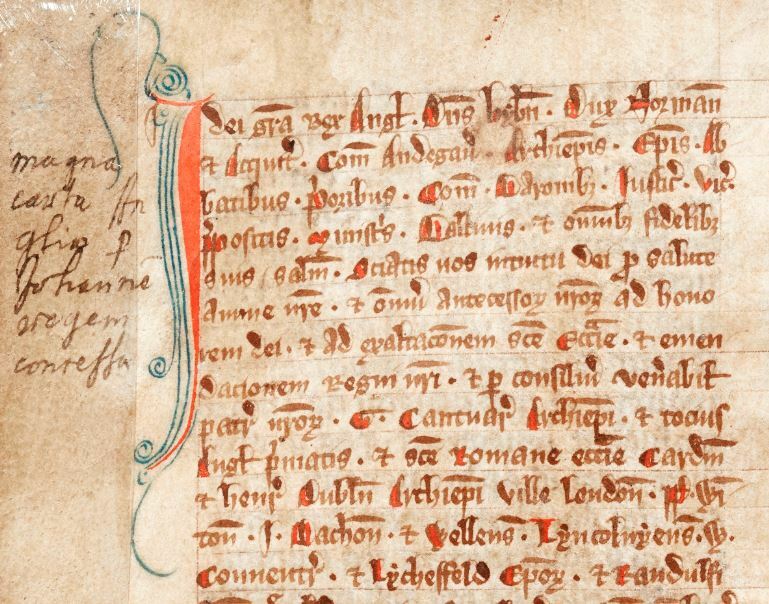 The Irish Legal History Society marked the 800th anniversary of the transmission of Magna Carta to Ireland with a major two-day conference. Magna Carta is one of the most famous documents in the history of the world, credited with being the first effective check in writing on arbitrary, oppressive and unjust rule — in a word, on tyranny. The fame of Magna Carta spread across the world as England, and later Britain, came to girdle the globe in its power. What is the place of Ireland in the story of Magna Carta’s global dissemination? Four centuries before the Great Charter crossed the Atlantic, it was already implanted across the Irish Sea. 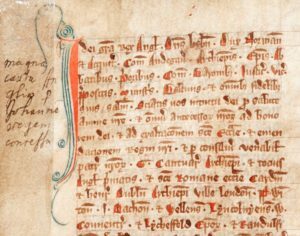 A version of the charter issued in November 1216 in the name of the boy-king Henry III was sent to Ireland, where it became fundamental to the English common law tradition in Ireland that survives to the present. The conference explored the legal-historical background to Magna Carta in Ireland, the reception of the charter into English law in Ireland, the political and polemical uses to which the charter was put, and its twentieth and twentieth-first century invocations as a living presence in contemporary Irish law. Professor Paul Brand (All Souls, Oxford) delivered a keynote address on the impact of Magna Carta on the development of English law in medieval Ireland. A particular concern of the conference will be to explore the paradoxes presented by the reception of Magna Carta into Irish law, above all the contested and often highly restrictive-idea idea of ‘liberty’ that developed in Ireland from the Middle Ages onwards. This conference was held in the Music Room of Christ Church Cathedral, which boasts its own copy of Magna Carta in the Liber Niger held in the cathedral treasury. This conference took place in the Irish House of Lords, Dublin on 27 and 28 November 2014, organised by Dr Coleman Dennehy (University College Dublin / University College London) in association with the Irish Legal History Society, and supported by the ILHS, the Bank of Ireland, UCD Humanities Institute, University College London Department of History, and UCD School of History and Archives. The conference was recorded for podcasting by Real Smart Media and all podcasts are embedded below, and are also available for download via the UCD Humanities Institute podcast series on iTunes. About the conference: The 1641 rebellion, subsequent wars, and the political change that followed were to have a profound and lasting effect on the island for generations. Recent historiographical trends have seen great strides made in our understanding of the military, political, and religious aspects of this upheaval, but despite some notable work already undertaken, the role of lawyers and the law in this general crisis still warrants further attention. How consistent with the law and the constitution of Ireland was government policy and its main actors in the decade before the rising? What role did the legal community play in the wars and political dynamics of the period? How did the law adapt to the new political realities in Ireland after 1649, and how was it used to effect a restoration of peace and stability after 1660? To what extent do these changes reflect the situation in Scotland and England at the time? These questions and others were considered at the Law and Revolution in Ireland conference. Podcasts of the other papers can be downloaded from SoundCloud and photos of the conference are available on Flickr. Dr Coleman Dennehy (University College Dublin / University College London) – Appointments to the Irish bench in the early Restoration period. Dr Stephen Carroll (Trinity College Dublin) – Competing authorities: the clash of martial and common law in early seventeenth-century Ireland. Dr Aran McArdle (Trinity College Dublin) – ‘Necessarye to keepe Irelande in Order’: Martial law and the 1641 rebellion. Dr Bríd McGrath (Trinity College Dublin) – Electoral law in Ireland in the early seventeenth century. Dr John Cunningham (Trinity College Dublin / University of Exeter) – Lawyers and the law in the writings of Sir William Parsons. Dr Neil Johnston (Department of Culture, Media & Sport) – Charles II’s legal officers and their influence on the Restoration land settlement in Ireland, 1660-65. Professor James McGuire ( Irish Manuscripts Commission) – Governing Restoration Ireland: the evidence of the proclamations, 1660–70. Dr Andrew Robinson (Northern Ireland Policing Board) – ‘Twixt Treason and Convenience’: Protestant Ireland and the trial of the earl of Strafford. Jennifer Wells (Brown University / Institute of Historical Research) – Scottish and Irish Resistance to Cromwellian Legal Measures. Prof. Andrew Carpenter (University College Dublin) – Lawyers and the circulation of scurrilous verse in Restoration Dublin. Dr John J. Cronin (University College Dublin) – Countering a revolution with law: the role of the Irish royalist elite in the law courts of the exiled Charles II: 1649-1660. Prof. Colum Kenny (Dublin City University) – Shooting stars and survivors: King’s Inns revisited 1648-1661. 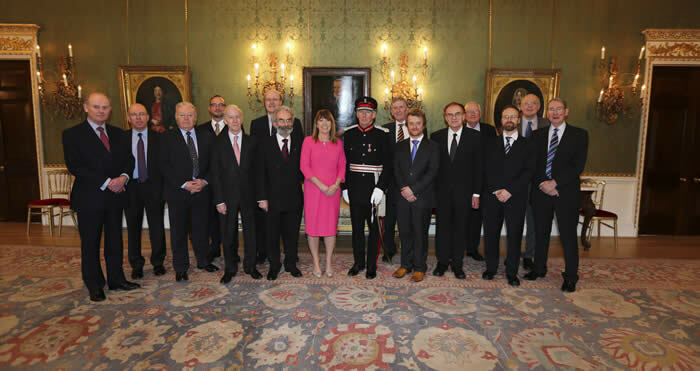 On 6 February 2015 members of the Council of thye Irish Legal History Society were received at Hillsborough Castle in Belfast. The Head of Hillsborough Castle, Mrs Corbett, accepted the donation of the Society’s 23 published volumes on behalf of Her Majesty Queen Elizabeth. The books will be placed in ‘Lady Grey’s Study, part of the Library Suite in the State Apartments at Hillsborough. 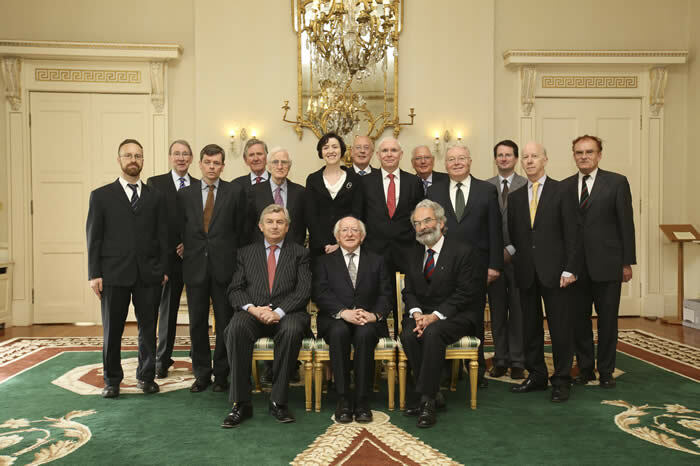 President Higgins received members of the Council of the Irish Legal History Society at Áras an Uachtaráin on 22 May 2014 to mark the conclusion of the 25th anniversary year of the society. 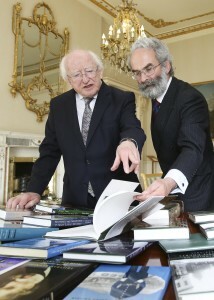 The society presented to the President a complete set of the 23 volumes published by the society since its foundation in 1988, for the library he has established at Áras an Uachtaráin. Welcoming the members of the council, the President said he was delighted to meet with those jurists, legal experts and scholars who had come together in a spirit of professional pride to acknowledge and document a shared history and legal culture. He said that the commitment of the society to ensuring publication of documents and learned works on the history of Irish law allows access to an important part of the narrative of this island. He added that the volumes published by the society are an essential resource for those who wish to engage with the legal history of our island, to understand the complex interplay between the two jurisdictions on the island and to gain an appreciation of the consequences of considerations, decisions and actions that occurred in the past for both our present and our future. The President said that one of the projects during his incumbency is to develop a library at the Áras which will be a resource for future holders of th e office, so he was especially grateful to the society for presenting the 23 volumes which it has published. He regarded them as a remarkable collection which would give much pleasure and be a very valuable addition to the Áras library. In reply, Robert D. Marshall, solicitor and president of the society, expressed the society’s appreciation of President Higgins’ generosity in receiving the council at Áras an Uachtaráin. He noted the importance of the house for all of the traditions on the island, having been at the centre of formal constitutional and legal events for over 200 years. ‘The books’, Marshall said, ‘are the record of endeavours by scholars interested in Irish Legal history to analyse the legal history of all the traditions on this island.’ The authors and editors include historians and lawyers in the universities but also members of the judiciaries and practising lawyers from both jurisdictions. Amongst the authors of books present were Prof. Desmond Greer QC (hon. ), Prof Colum Kenny BL and Dr Kevin Costello. The work of the society could not be accomplished without the contributions of those who edited the volumes and collections of essays, seeking to maintain the high academic standard set by Prof Osborough the first literary editor of the society. The editors present were Daire Hogan who edited Brehons Serjeants and Attorneys with Prof Osborough and Changes in Law and Practice with Prof. Kenny, respectively the first and most recent publications by the society. Other editors present were Dr Kenneth P Ferguson BL and Felix M. Larkin, one of the joint editors of Lawyers, The Law and History.